Understanding of the scope of the opioid problem, current status, and future regulations. .Partnering with medical teams in the treatment of pain management. Keith C. Raziano, M.D. is the C.E.O. and Managing Director of the Physicians Spine & Rehabilitation and has been practicing medicine for over 18 years. He is currently based in our Sandy Springs office. 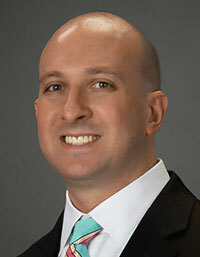 Dr. Raziano received his undergraduate degree in Biology from the University of Miami and his medical degree from the University of Miami School of Medicine, where he served as a Teaching Assistant. Dr. Raziano completed his surgical internship at Orlando Regional Medical Center and completed Residency training at Emory University Hospital. He served as Chief Resident and Clinical Instructor at Emory and was voted Attending of the Year. Dr. Raziano has continued to teach in his capacity as an Associate Clinical Professor in the Department of Physical Medicine and Rehabilitation. Dr. Raziano is board certified in Physical Medicine and Rehabilitation with an additional subspecialty and board certification in Pain Medicine from The American Board of Physical Medicine and Rehabilitation.